So, 9 years ago: Back when I was still writing feature articles for MobyGames, one article idea I had was to shed light on this mostly forgotten aspect of computer gaming history. I was going to do this by writing up a small segment per game on what audio was included and why, and then provide snippets of audio to illustrate what it was like. But the more I listened to the tapes and wrote, the more I felt that little snippets of audio weren’t going to be good enough — there was some real historical gems in these things, like Chuck Yeager talking about what it was like to be a test pilot, or how early home computer programs needed to hold the hands of new users every step of the way, or how much craft went into a title song (with lyrics!) composed specifically for a game. Small snippets of audio just weren’t going to cut it. But I couldn’t just blatantly reference an entire dump of the cassette either, because I was worried about copyright infringement. So while I wrote up the entire article, I never published it. Flash-forward to 2010, and I’m not so worried about copyright infringement any more. In the last nine years, we’ve seen some great advancements in how game companies treat their older IP — they either respect it and turn it into new-old properties (like Sam & Max or Monkey Island episodes), or they have built goodwill amongst their fan base by either giving away entire libraries (such as the entire Vectrex game library) or changing their minds and allowing fanfic productions to be distributed. Even Apple, notoriously stingy about protecting their marks and IP, cleared the release of some significantly historical code today (the original QuickDraw and MacPaint). So I’ve decided to publish the article after all, but as regular installments here in my blog. I’ve re-read the Fair Use clause of US copyright policy (title 17, chapter 1, paragraph 107 is the relevant part) and I believe my use of these works fall squarely into educational non-profit usage, nor harm the present or future profitability of these works as the companies that produced them are long gone (and, sadly, some of the people involved in creating them are gone too). I view these installments as a historical exercise, but as always, if any corporate lawyer disagrees with me, I’ll be happy to take the articles down. What follows is the original intro I wrote for the article, as well as our first featured included audio cassette: Homeword. 1983: You’re Sierra On-Line, and you’ve written a word processor that anybody can use, thanks to the clever use of graphics to visualize concepts — paper for files, filing cabinets for folders/directories, etc. There’s only one problem: It’s the dawn of the personal computing industry, and true novices don’t know how to operate the computer they just purchased. How can you wow them with the simplicity of your program when your users can’t even boot it? Pardon the pun, but it sounds like some audio would do the trick quite nicely. A read-aloud tutorial that eases new computer owners into word processing would help Sierra’s case, and the evidence that was used to frame the main character would be a great addition to Rainbird’s game. But what can you do? As a publisher, you can’t just jam disks and disks of digitized sound into the package; the cost would eat at your bottom line. And most computers in the 1980s didn’t have built-in sound devices to play digitized sound anyway, let alone hard drives to store it all. The use of audio cassettes in early software (not just games) was diverse: Some held instructions or tutorials, others held enhanced title music, and still others were essential portions of the adventure game you were trying to play — audio cues/clues, if you will. We take multimedia for granted today; there are no game titles released without music and speech that expect to make a buck on store shelves. But opening a software package in the 1980s and finding a cassette — well, that was a real treat. In most cases, it was justified and honestly enhanced the end-user’s enjoyment of the product. In this feature, we’ll take a look at some of the included audio cassettes that came with early software titles (not all of which were games), examine how they made the software experience more enjoyable for the end-user, and — this is the best part — provide full-length low-bitrate versions of the cassettes so that you can hear what they sounded like. Jason Artman contributed a recording of the Sierra Lounge. Jason has contributed to MobyGames before in a big way: he was the first person to write a feature article for MobyGames. C.E. Forman lent me a copy of The President Is Missing (thanks Chris!). You can visit his excellent Ye Olde Infocomme Shoppe if you want to see how a true software collector works his hobby. Tony Van, who went above and beyond the call of duty to contribute four rare audio clips with descriptions to the project. We’ll start our journey into the world of low-tech audio with Homeword, a word processor. Wait, don’t leave! Yes, it’s a word processor, but it was put out by Sierra On-Line, once one of the most prolific game companies in the first two decades of computer gaming. Homeword isn’t a game, but it was produced by Sierra On-Line in the early 80’s, so we thought we’d cover it as a historical exercise. Sierra helped solved this problem with a helpful tutorial included in the Homeword package that walked you through the word processor’s various functions. It did so from the absolute beginning: “Hold your diskette with your thumb on the label, label side up. 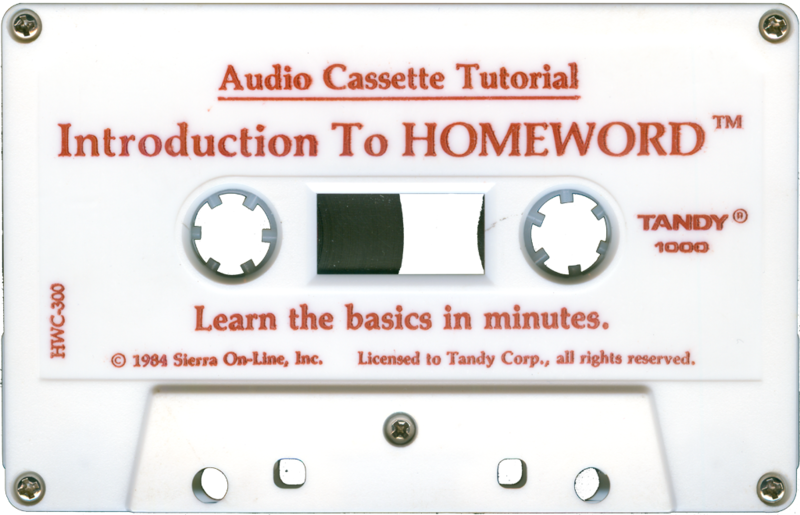 Insert your Homeword diskette into the disk drive, close the drive door, and power on your computer.” The resulting cassette is a mostly a tutorial on working Homeword, but also a small primer on the basics of computing, floppy disks and other basic computer concepts. High points: Calm, friendly narrator; long pauses while the user attempts what was just suggested; cute early-1980s synthesizer music intro. Low points: Included pauses weren’t consistent — some were very long for short tasks, other were a bit short for longer tasks. Trivia: Sierra wasn’t the only game company to test non-gaming markets; early software companies often shifted product lines around. Tom Snyder Productions, which we’ll cover later, did the same thing (although the successful business they’re in today is educational software and television production, not entertainment titles). Broderbund came out with several applications for the home, including the popular Bank Street Writer. Even Infocom attempted to go into the business market, but with disastrous results — the effort involved in getting the Cornerstone database product to market contributed greatly to the demise of the company. This entry was posted on July 20, 2010 at 11:21 pm	and is filed under Vintage Computing. You can follow any responses to this entry through the RSS 2.0 feed. You can leave a response, or trackback from your own site. I CLICKED THIS LINK EXPECTING HOMEWORLD AND ALL I GOT WAS THIS STUPID WORD PROCESSOR. Nice work. I’m looking forward to the one on “Sub Mission”. Some of the 8-bit systems with dedicated cassette players could control the cassette motor independently of controlling whether the cassette audio was sent through the computer’s speaker. This means that you could have actual audio on the cassette as well as the program. I’m thinking particularly of the 8-bit Atari systems here – many years ago (probably around 1990) I was at a friend’s house and we were loading a game on his Atari that he hadn’t played before. As the game finished loading we were stunned to hear what we initially assumed was software generated speech, except that it was the most amazingly high-fidelity speech/sound that we had ever heard come out of any computer! We tried to figure out how it was done for a while, and then we realized that it was all a trick – it was just coming straight off the tape. Hiya. Thought I’d check on progress for Mindcandy Vol 3 (after discovering that the disk for Vol2 isn’t in the case, and I last watched it two housemoves ago… time to order a new copy!) and stumbled across this. Back in the early 1980s, there was a distinctly experimental software company in the UK called Automata – having formed in the seventies, they’ve got a reasonable claim to be the first ever UK game developer. Anyhow: aside from making smutty games for the ZX81 and inventing a strange character called Pi-man, they also dabbled with what was perhaps the world’s first art game: Deus Ex Machina, released in October 1984 on the 48k ZX Spectrum. And to go with the game, they produced a tape-based soundtrack, featuring music and readings from famous actors and musicians such as Ian Dury, Jon Pertwee (the third Doctor Who) and Frankie Howerd. The gameplay revolved around the birth, life and death of a mutant lifeform, as represented by a series of minigames; each minigame lasted for a fixed amount of time and the soundtrack was (theoretically) sync’d to the minigames. I finally got around to watching this series — what an amazing effort on the part of Automata! The soundtrack was interestingly ahead of it’s time — “laying down cable and signal” for example.